Rory Skinner fought back to score nine valuable championship points in the British Talent Cup race at Snetterton today, heroically fighting back to seventh place after a mid-race crash dropped him down the order. Starting from pole position, the 16-year-old Scot looked to repeat his win in yesterday’s opening race. He inherited the lead when rival Max Cook slid off at the end of lap one and Rory set a new lap record of 2:02.649 as he extended his lead over second placed Thomas Strudwick to three seconds, only for disaster to strike on lap six, when he made a mistake at turn two and slid off. 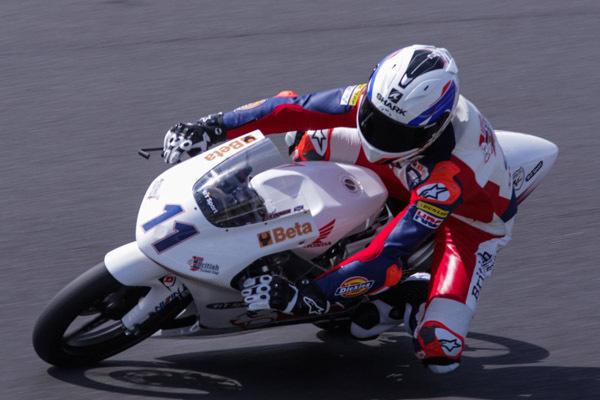 Rory remounted and restarted his Honda NSF250R Moto3 machine as quickly as possible, but lost over 20 seconds in the incident and found himself relegated to 16th place. The former Red Bull Rookies race winner pushed hard and, despite some damage to his machine, was able to return to his pre-accident pace. Carving through the field, he charged through to seventh at the end of the 14 lap race, just over 16 seconds behind winner Strudwick. Despite losing his British Talent Cup points lead, Rory remains second in the standings – on 85 points to Strudwick’s 98. The championship now takes a break of over two months, with the fourth round scheduled to take place alongside the GoPro British Grand Prix at Silverstone, on the weekend of 24-26 August.